Brent Primus is a Brazilian ju-jitsu fighter who trains out of the Northwest Martial Arts Academy in Eugene, Oregon. While most fighters have been documented for their work ethic in the gym, Primus’s entire life defines what it truly means to work hard. Overcoming many obstacles put in front of him, his life story has contributed to his growth as a martial artist and desire to become the best. Born and raised in Eugene, Oregon Brent Primus grew up in a loving single parent home with his mother and older brother. His mother worked hard raising the two boys on her own, often working two jobs to support them. As time progressed his mother would eventually meet his stepfather, who came from a religious military background. Brent felt bombarded with his stepfather’s new strict policies, which caused major conflict between the two ultimately reaching a boiling point resulting in Brent leaving home at the age of thirteen. Now out on his own with ultimate freedom at his disposal Brent was finally able to live life the way he wanted too. Unfortunately this new indulgence would find the teenager going down a negative path making many bad decisions in his life. After I moved out it was like the ultimate freedom. In that time I didn’t have anyone telling me what to do, when to be to school, when to be home, right from wrong really. I experimented with drugs and alcohol at an early age, partying, fighting and just really not caring,” he said. Struggling to get by Brent would find himself staying at different places over the years eventually finding a stable living condition with his grandparents until he was able to provide for himself. During his time with his grandparents Brent made a conscious decision to go to work. Determine to make it on his own he would acquire many small jobs including owning a landscaping business at the age of eighteen. “I’ve always had a very strong head. Anything I want I go for and anyone who says I can’t do something I’ll prove them wrong. I was determined to make it on my own. I started applying for jobs at 14 but no one would hire me. My grandfather owns a logging company so I worked for him setting chokers and even picked berries at local farms. I also mowed lawns and raked leaves and really any side job you could think of. I would literally do anything for a few bucks, “he said. Hoping to find a more positive outlet outside of his job, close friend Ben Baxter invited him to train at his marital arts academy introducing Brent to the sport of Brazilian Jiu-jitu. After experiencing his first taste of it, Brent instantly became attached and from that day forward found a new calling in his life. So much so that he sold his landscaping business in order to fully commit to his new venture. “ One of my good friends, Ben Baxter, was currently training Jiu-Jitsu and MMA at Northwest Martial Arts Academy in Eugene and said I should come in and check it out. I went in and began watching some of the guys. I was like, “These guys aren’t so tough”. I ended up getting my a** handed to me that first day! I quickly realized that it didn’t matter how strong you were, it was all about technique. That’s all I needed! I was hooked!,” Brent said. From past lessons he’s experienced, Primus knows what it takes to achieve success. The blood, sweat, and tears he puts into his training is unparalleled as his instructors and teammates would find Brent in the gym throughout the week training two times a day along with working on his own cardio routine to keep him in shape. Long time friend and former instructor Ben Baxter has seen his growth from the beginning and is a witness to Brent’s commitment to the sport. “We have been training together for years. He is a good athlete with unlimited potential, one of the hardest working guys you will ever meet,” Baxter said. This dedication has led him to great success. In his six years of doing Brazilian jiu-jitsu, Primus has accumulated many notable BJJ titles including becoming a 2 time Las Vegas Champion, Pan American Champion, amongst many other prestigious awards. 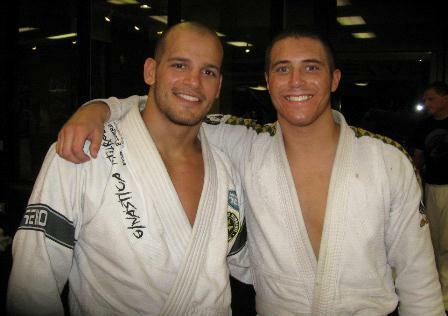 Receiving his brown belt in 2009, Primus continued his impressive winning streak. Thus far as a brown belt he has put on stellar performances in venues across the west coast winning every tournament he has entered without having a single point score against him. In the MMA circuit Primus has accumulated an impressive amateur record of 6-1, winning most of his fights by TKO or submission. As a pro fighter, Primus continues to dominate the competition in his ascent up the MMA ladder. With many accomplishments already under his belt, Primus looks toward the future. His future goals include: aspirations of fighting in the UFC, becoming a Brazilian Jiu-Jitsu world champion, and obtaining sponsorship to support his future endeavours. From his days of living on his own to his arrival at Northwest Martial Arts facility Brent Primus has come a long way since his troubled days as a youth. Since his martial art journey begun, Brent has undergone a remarkable change becoming more positive, confident, and even mentoring others down the right path. His story is a prime example of not only what working hard can get you but also how martial arts make a positive difference in people’s lives. “MMA and Jiu Jitsu has changed my life in every aspect, to live a healthier life, self discipline, respect for myself and others, confidence in myself and my abilities, to be humble. I have to say that the guys that have made me the fighter and competitor I am today are Ben Baxter and Evan Dunham who were my first training partners, my instructors Ryan Clark, Ryan Kelly and Harold Utterback. I would like to thank them and all of my teammates at NWMA. I wouldn’t be where I am today without them”.